In Lutheran Germany of Bach’s time the Whitsun or Pentecost festival was celebrated like other high ecclesiastical feasts on three consecutive days, Sunday through Tuesday. Music was performed in the services on all three feast days and Bach usually wrote cantatas for each of them. Extant are for Whit Sunday the cantatas “Erschallet, ihr Lieder” BWV 172 (Weimar and Leipzig versions), “Wer mich liebet, der wird mein Wort halten” BWV 59 and 74 (two different settings), and “O ewiges Feuer, o Ursprung der Liebe” BWV 34; for Whit Monday the cantatas “ Erhöhtes Fleisch und Blut” BWV 173, “Also hat Gott die Welt geliebt” BWV 68, and “Ich liebe den Höchsten von ganzem Gemüte” BWV 174; and for Whit Tuesday “Erwünschtes Freudenlicht” BWV 184 and ”Er rufet seinen Schafen mit Namen” BWV 175. 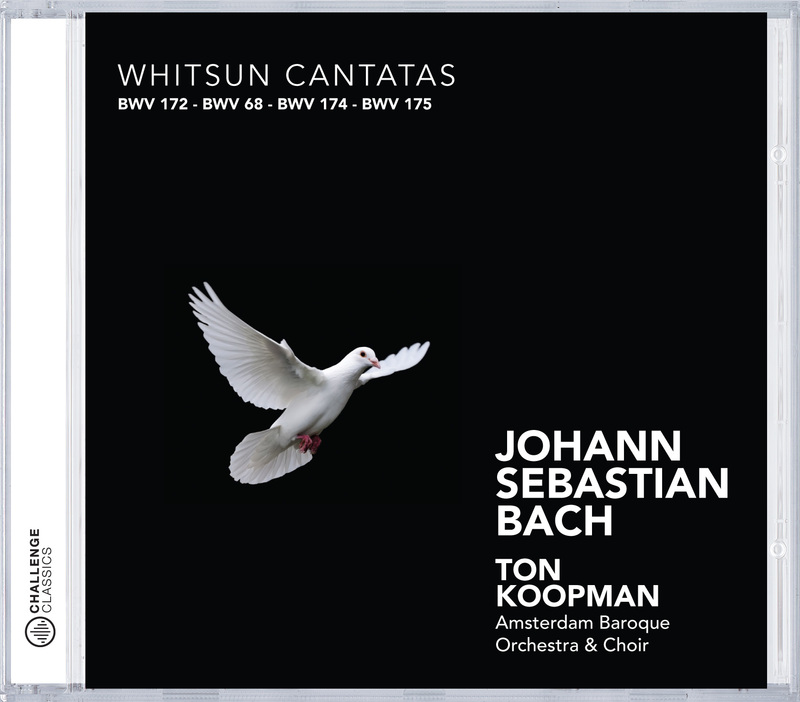 Of these nine Whitsun cantatas, the present album presents a representative cross-section: BWV 172 for the Sunday and then BWV 68 and BWV 174, respectively, for the Second Day of Pentecost, and BWV 175 for the Third Day. As is typical for works to be performed on the high feasts, they invariably display a rich instrumental configuration: BWV 172 includes trumpets and timpani; BWV 68 makes use of 3 oboes, violoncello piccolo, and supporting cornetto and trombones; and BWV 174 features 2 horns, 3 oboes, along with an unusual complement of nine concertato strings. The traditional gospel lessons for Whit Sunday are John 14: 23-31 (descent of the Holy Spirit upon the apostles) and for Whit Monday John 3: 16- 21 (“God so loved the world”). The cantata texts chosen by Bach relate closely to these liturgical readings prescribed for the church year, for in the Lutheran worship service the cantata was generally understood as a musical complement to the preached sermon and, therefore, pursues the same topical contents. The cantata “Erschallet, ihr Lieder” BWV 172 for the First Day of Pentecost was originally composed in Weimar and probably first performed there in 1714, but re-performed in Köthen as well as in Leipzig. Bach made some revisions for the 1724 performance in Leipzig and adapted the earlier work to the conditions of a much larger performing space. The text of the cantata, possibly by the Weimar court poet Salomon Franck, consists primarily of free poetry but includes a passage from the Whit Sunday gospel (John 14: 23) in the second movement and a strophe from Philipp Nicolai’s hymn “Wie schön leuchtet der Morgenstern (1599). The cantata “Also hat Gott die Welt geliebt” BWV 68 for the Second Day of Pentecost was composed and first performed in 1725. Its text was authored by Mariane von Ziegler, who used a hymn stanza by Salomo Liscow (1675) for the first movement. The fifth movement draws on John 3: 18 from the scriptural reading for the feast day, to which the hymn also refers. The instrumental forces of the cantata include three oboes, violoncello piccolo, strings, and continuo, but also cornetto and three trombones in support of the choral voices. Here Bach had to take into consideration the severe demands made on his singers during the high church feasts with their multiple performances at three different Churches, regularly at the two main churches of St. Thomas’s and St. Nicholas’s as well as at St. Paul’s, the university church on the First Day of Christmas, Easter, and Pentecost as well as St. Michael’s Day. In BWV 68 the soprano and bass arias, movements 2 and 4, are lavish reworkings of arias from the Weimar Hunting Cantata BWV 208 of 1713. The cantata “Ich liebe den Höchsten von ganzem Gemüte” BWV 174 was composed for the Second Day of Pentecost in 1729 and—a rare phenomenon—shows that date in Bach’s autograph score. Its text is taken from the volume of cantata poetry (1728) by Christian Friedrich Henrici (‘Picander’) and refers closely to the gospel of the day, which also affects the choice of the concluding hymn strophe by Martin Schalling (1571). The cantata shows a magnificent and varied instrumental scoring, making use of two horns, three oboes, strings, and continuo. Apparently the ensemble at Bach’s disposal was for the occasion reinforced by members of the Collegium musicum, of which Bach had recently (in May, 1729) become the director. However, the essentially soloistic vocal complement with alto, tenor and bass (the choir is used only at the very end) indicates — as in BWV 68, above — Bach’s desire to reduce the demands on the choir for the second and third of the three feast days. By way of inaugurating his collaboration with the Collegium musicum, Bach began his cantata with a splendid sinfonia. Here he arranged the opening movement from Brandenburg Concerto no. 3, a ten-voice string score, by adding five wind parts to the original ensemble of pure strings. The cantata “Er rufet seinen Schafen mit Namen” BWV 175 for the Third Day of Pentecost was first performed on May 22, one day after the first performance of BWV 68 (see above). Not only these two works were composed side-by-side, but additionally also BWV 74 “Wer mich liebet, der wird mein Wort halten” for Whitsunday of 1725 (not included in this album)—indicative of both Bach’s productivity and the pressing church music schedule at certain times of the liturgical year. The text of BWV 175, like that of BWV 68 by the Leipzig poetess Mariane von Ziegler, makes use of two passages from the Gospel reading for the day, John 10:1-11 (Jesus as the Good Shepherd), for movements 1 and 5. Movement 7 presents the final strophe of the hymn “O Gottes Geist, mein Trost und Rat” by Johann Rist (1651). The rich instrumental scoring of the work includes not only trumpets and three recorders in the orchestra, but also a violoncello piccolo for the solo in aria no. 4, whose text refers to the “good shepherd.” Similarly, the instruments assigned by Bach to the other two arias also support individual sonorities and the expressive needs of the texts. Hence, the three recorders lend pastoral character to the alto aria no. 2 (“my shepherd, my friend”) and the two trumpets in the bass aria no. 6 underscore the victory of Jesus over Devil and death. Erschallet, ihr Lieder BWV 172 Chorus: Erschallet, ihr Lieder, erklinget, ihr Saiten! Erschallet, ihr Lieder BWV 172 Aria: Komm, laß mich nicht länger warten? Also hat Gott die Welt geliebt BWV 68 Chorus: Wer an ihn gläubet? Ich liebe den Höchsten von ganzem Gemüte BWV 174 Recitative: O Liebe, welcher keine gleich! Er rufet seinen Schafen mit Namen BWV 175 Recitative: Wo find ich dich?